How do I revalue an asset so it will be reflected on my Asset and Liabilities (Net Worth) Report? This is an advanced function that provides a simple means of changing values for assets and liabilities without the need for complicated journal entries - the system creates the entries for you. 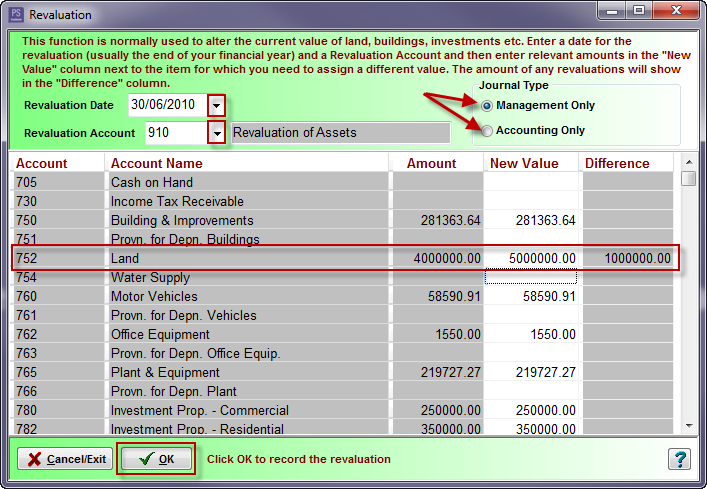 This function is normally used to alter the current value of land, buildings, investments, etc. Click on the Transactions > Revalutaion menu option. Enter a date for the revaluation (usually the end of your financial year). Choose an account (from the drop-down list) to receive the resulting revalution amount - this would normally be an equity type account such as Revaluation of Assets. The system will display a list of assets and liabilities (except banks, trading stock, GST clearing account and debtors/creditors countrol accounts) as at the nominated date in a tabular form - you may now enter any required revised values in the New Value column. The amount of the revaluation will display in the Difference column. Click on the OK button to process the revaluation. Click on the Journal toolbar option to see the journal entry created. Note: To see asset revaluation reflected on the Asset and Liabilities (Net Worth) Report you must run any report based on the same Journal Type selected. i.e. Management or Accounting. To reverse a revaluation, click on the Journal toolbar option and delete the relevant journal transactions.